I am 23 weeks pregnant and this ultrasound was taken at 19 weeks. I am so excited..I am 18 years old and this is my first pregnancy. My future husband and I can't wait 'till these little babies are born! 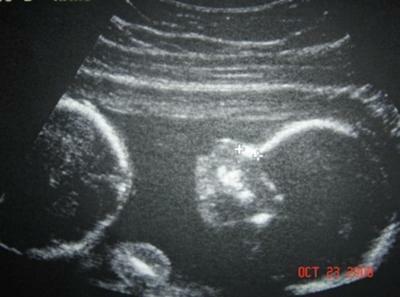 congrats i'm 19 and first time pregnancy with twins found out April 1st. We are like 2 of 100 people under 20 with twins.